For the most part, the folks who came along during the Neo-Soul boom (as opposed to before) were lame. D'Angelo? Great. Musiq? Lame. Erykah? Great. India Arie? F'ing awful. There are only a couple of exceptions, the biggest of which was/is Bilal. People have compared B's voice to Prince, which I think is fair, but Bilal is a real singer in a way that Prince never was. Prince's singing compliments his everything else quite well -- but as much as I love him, his singing has never been interesting enough to be great. Bilal, in contrast, is nothing but interesting. As ?uestlove points out in this great blog post, he's the rare jazz-based singer who is willing to lay his heart on the line like a gospel singer. Sometimes his choices are wrong, sometimes his odd tonal choices (and they are choices) are tough to hear, but he lays it out every time. The result is often amazing. On his first LP, First Born Second, he worked with a range of R&B and soul's best producers, from Raphael Saadiq ("Soul Sista") to Dr. Dre (the awesome "Sally" and "Fast Lane"). The rawness of his vocals complimented both of those producers perfectly. His next record has been promised for quite some time, but it still hasn't come. I can't wait. ?uest's myspace page currently has an amazing jam from the Roots' Radio City Music Hall dates a couple weeks ago... a couple of great Bilal songs including one of the best smooth ones, "Sometimes." A reminder from your friendly neighborhood me. Philip Lopate's "American Movie Critics: An Anthology from the Silents Until Now" is featured in the Times Book Review this week. Field Mob have a new record coming out, called "Light Poles and Pine Trees." Their single "Sick of Bein' Lonely" was a hit a couple years ago, but they've never managed to break through on the album tip. It's too bad, because they're the second-best lyrical stylists in the South after Ludacris, and their lyrics are much stronger than his. They switch flows liberally and with facility, presenting an almost bewildering array of styles. Luda has signed them up to his imprint, and hopefully that'll lead to success for them, because they deserve it. XXL Magazine gives "Light Poles and Pine Trees" an "XL"
One of the big questions I get a lot is, "when will some of these folks I hear on The Sound of Young America come to (Florida, Montana, Louisiana, Minnesota, etc)?" 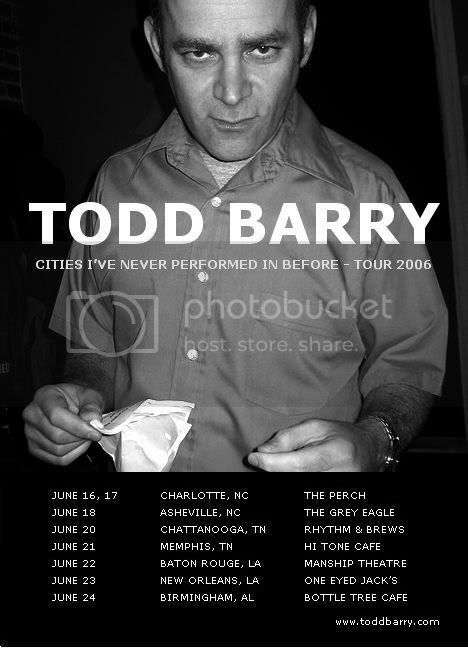 For those of you in the South, two great acts are headed your way: Todd Barry and Matt Besser. Todd Barry is one of the funniest standups in America right now, with a biting wit and a hilariously dry delivery. He's been on The Sound several times: his comedy was part of the Joketacular episode, and the old streaming archives have a realaudio interview with Todd here. Matt Besser most recently was on our air to talk about the Upright Citizens Brigade's "Asssscat Improv" special on Bravo (MP3 Link). I saw an early version of the one-man show he's touring with, "Woo Pig Sooie," in San Francisco last year and really enjoyed it. It's a thoughtful, funny, and ultimately surprisingly and powerfully personal look at faith and the seperation of church and state. Monty Python urges you to subscribe! Courtesy of WTTW television, who were apparently jealous of our exclusive Python footage. Unearthed from their vaults. "Thanks for linking to the Python video, but this posting didn't have anything to do with WTTW or their jealousy, nor was it unearthed from their vaults. This was taken from a collection of U-Matic tapes preserved by a Python associate which I thought would be fun to share." Here's Andy Kaufman performing the Slim Whitman class "Rosemarie" on David Letterman. Also, he is wearing a turban, a false moustache and a diaper. The Sound of Young America: The American Dream (MP3)... We talk with Florian Keller, author of "Wrestling with the American Dream," about Andy Kaufman. On this Sound of Young America: The College Years, it's an epic Battle of the Dads. We kick things off with an original song about dads, then call our respective dads and have them duke it out by revealing embarassing secrets about our childhoods. If you haven't listened to The College Years yet, now is the time to give it a shot. This one's an all-timer. Jurassic 5 are working with Dave Matthews Band. Somehow, they just managed to blow right by the Black Eyed Peas on the road to self-parody.